What is an Author Impact Radius? What’s a radius? It’s the measurement for a circle’s width. In the same way, an impact radius is the measurement of how wide the impact is. When applied to authors, what I mean by an impact radius is everything that an author or author’s books impacts. The lives you enhance with your powerful writing, the laughs you induce with your humorous words, and the emotions you evoke with your pen. After all, the pen is mightier than the sword. Your impact radius should be more than that of wars. An author impact radius includes everything from book downloads to the author’s Twitter follower count to the readers in languages the author doesn’t speak. 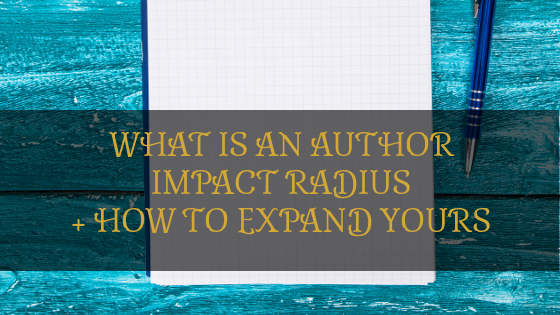 How Do You Expand Your Author Impact Radius? This is probably one of the most loaded questions. How do you persuade people to spend their precious time on your book? How do you cook pasta? How do you dress? Instead of brain-dumping my way through this blog post, I’m going to discuss some of the most important ways you can impact more lives with your words. Namely, social media campaigns, book translations, and speaking engagements. Now, social media in itself has a number of things to be discussed, but I’ll make them quick so you can get started on them! No matter whether you’re a total newbie at marketing, or you’re a former digital-marketer-turned-author, social media campaigns are some of the easiest things you can put together, to start with. Maintaining them can be tricky, especially if you don’t have a lot of experience and you suddenly gain traction and a whole lot of attention, but it’s not impossible to grow with them. Three things that you should start doing immediately to gain traction on social media platforms are live video, engagement, and outreach. Depending on how you prefer it, you could announce your livestream a few hours before it happens, or just hop on for an impromptu session. Both will having differing results and will allow you to learn more about your audience. Humans love to talk and interact with each other. On social media, this is called engagement. This is where you go around thanking followers for following you, replying to comments on your Facebook page, and talking to the people who talk to you. The easiest way to do this is to curate a few topics you’d like to talk about in advance, and then regularly go on your social media and talk about them. Keep track of which topics did well, and go deeper the next time! This is what your fans are doing all the time when they’re tweeting at you or commenting on your Facebook or Instagram posts. However, in order to maintain a fair balance in the social media multiverse, you should also do some of this on your own. Reach out both to people whom you are a fan of, and your own fans. The latter will make you highly popular and well-loved by your readers, especially if you take the time to connect with authenticity. One of the most underestimated sources of impact radius expansion is book translations. Because most self-published authors have no access to a publishing house that has established relationships with foreign publishing houses, it can be a very long and tedious process for a self-published author to get their book translated into certain languages. However, the process is worth it, as at the end of it, you will have your book translated to a language that you can’t write in, thus increasing your impact radius with a huge number of potential readers. Again, the marketing efforts of your language partners or the foreign publishing house will go a long way in making this worth the time, money, and effort spent on it. Probably the easiest way to get your message out to a large number of people is speaking at an event. No matter whether you speak to an audience of 100 people or 100,000 people, this is still the best way to engage with an audience. Raw, live, and with their undivided attention. Even if it’s an online audience, knowing that they’ll be there for 10 or even 90 minutes, you can be sure of their undivided attention for any amount of time, ranging from a few minutes to the entire time you’ll be speaking. This gives you more confidence with your content, and allows you to prepare yourself without the fear that you might be having with social media, where you keep thinking: what if no one reads my posts? What if all I’m doing is shouting out into the void? Even if it’s an online event, speaking about a topic you’re passionate about to an audience full of people eager to hear your thoughts is one of the best ways to gain new readers and impact a few more people’s lives. Make sure to be yourself, and all will be well!